Okay, I posted this on my friend's fb wall as a request from him and I thought I'd share here as well. Ok, steamed chicken is pretty easy. First do the sauce. Chop equal parts ginger(also chop very fine) and mix together. ...Add about a tablespoon of salt and mix. Spoon or pour very slowly the hot oil over the ginger and green onion. It should sizzle a lot. If it doesn't, your oil is not hot enough. Debone some chicken thighs, or if you're in Japan, you can buy them already deboned. Put a pot of water on the stove on high heat. While the water is heating up, add a teaspoon of salt, couple pinches of white pepper, a few slices of ginger, and a stalk of green onion chopped into a few pieces. When the water just hits the boiling point, add the chicken. The water will stop boiling when the chicken hits. Let the water warm back up to close to boiling tempurature but DO NOT BOIL. You want to cook the chicken in hot water, but not boiling water, this is key. Keep your heat low enough to not boil but keep the water really hot. Let the chicken cook slowly in the hot water for about 15 min or so. Take a piece out to check if you're unsure about doneness. 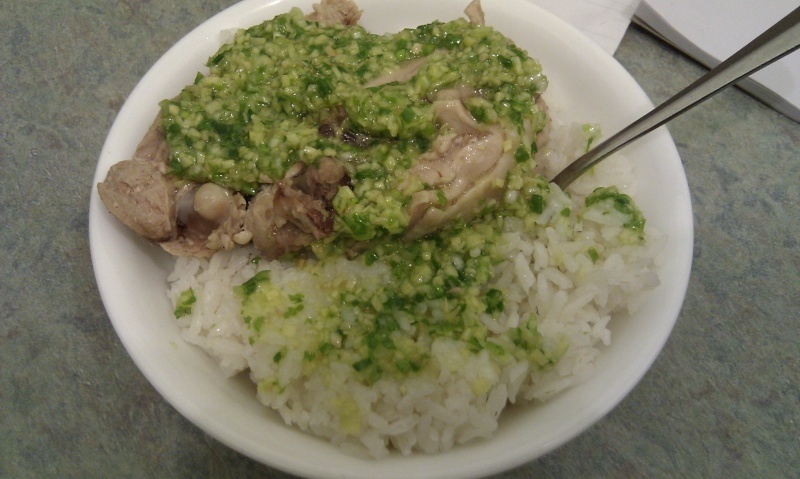 Chop chicken into slices, lay on top of rice and spoon sauce over chicken. The left over water is really good chicken broth, so keep it for soups or whatnot. wow this looks really good! will have to try! I've never cooked or used ginger before, it will be a first!